Acupuncture involves the placement of thin, sterile, stainless steel needles at specific points on the body where nerve bundles penetrate fascia, in close proximity to major blood vessels that are surrounded by small nerve bundles, and where nerves enter or exit muscles. Insertion of acupuncture needles (dry needling) results in a local and systemic response by the nerves in the region. Local effects cause the release of anti-inflammatory responses, improve circulation, and activate the immune system and tissue repair. Acupuncture is performed by a veterinarian certified in veterinary acupuncture. Acupuncture is used to treat acute and chronic musculoskeletal injury, improve the general well being of athletic horses, and provide additional systemic support for horses suffering from a broad range of medical conditions, such as gastrointestinal, kidney, liver, or lung disease. 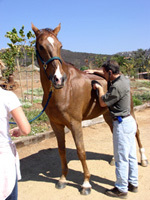 Dr. Brett Robinson of San Dieguito Equine Group is a Certified Veterinary Acupuncturist. Please call our office to schedule your horse’s next acupuncture appointment with Dr. Robinson. Veterinary chiropractic work focuses on maintaining and restoring the health of your horse's nervous system through identifying vertebral subluxation complexes and performing the appropriate adjustments in the spinal column or extremities. Your horse will be examined in static and dynamic motion. The veterinarian’s hands are used to assess the amount of motion/restriction in joints, spasm of muscles, flexibility, asymmetry, etc. When a joint is found to have decreased motion, a specific, low amplitude, high velocity thrust (i.e. adjustment) is performed. This restores appropriate communication between nerves in the nervous system. Veterinary chiropractic work may be used as an integrative treatment for musculoskeletal conditions, such as back, sacroiliac, and neck pain. Depending on your horse's history and examination, a period of rest may be recommended after treatment. A plan for future examinations will be discussed at the appointment, if needed. Some equine athletes are maintained on a monthly schedule while others may be examined once to twice yearly. Dr. Rebecca James performs chiropractic work at San Dieguito Equine Group. She completed training for Veterinary Chiropractic at Options for Animals and was certified in Veterinary Chiropractic by the International Veterinary Chiropractic Association. Please call our office immediately if you suspect that your horse may have an problem with their eye(s) or vision. We consider all ophthalmology issues as possible emergencies. Time is of the essence; the sooner a diagnosis is made along with a treatment plan, the higher the chances of a successful outcome. Board certified ophthalmologists are also available for advanced ophthalmology cases. Consultations can be scheduled at our clinic in San Marcos, CA. Annual dental examinations and routine dentistry are essential to early recognition and management of dental problems that can affect digestion, body weight, and performance. San Dieguito Equine Group provides power dentistry based on individual horses' needs to correct dental abnormalities and for preventative maintenance. For more information about what to expect when your horse receives dentistry, please see our dentistry Frequently Asked Questions (FAQ) page. General wellness management is essential to maintaining your horse’s health and performance. San Dieguito Equine Group is committed to providing general services such as vaccines, deworming, nutritional consultation, annual examinations, insurance examinations, Coggins testing, and travel certification. Our highly dedicated team would be happy to create an individualized wellness plan for your horse.